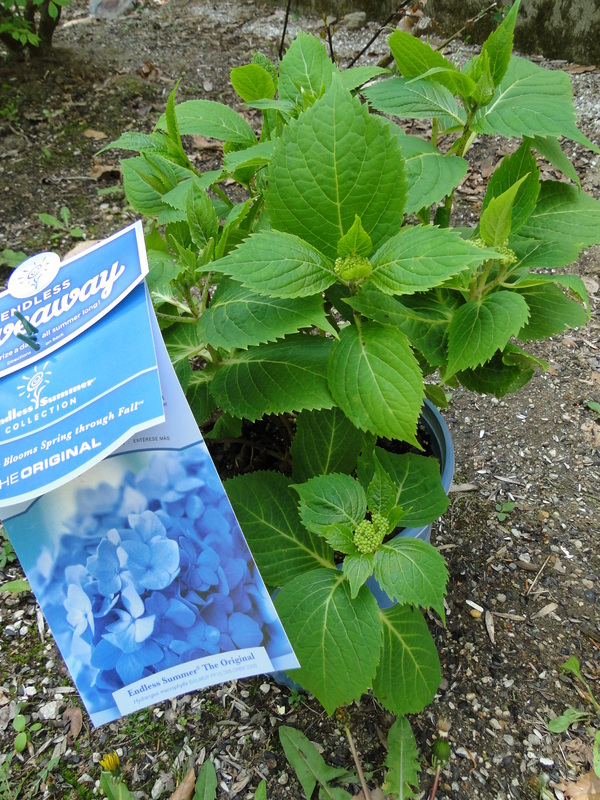 Spring is coming, and if you are already dreaming of shopping for a great landscape perennial, a beautiful addition to any garden includes the bright blue flowers of the Mophead hydrangeas. Often hydrangeas are at nurseries by the bucket load in spring, just in time for Mother’s Day. Hydrangeas bloom in July and beyond (in northern climates), so that means most likely they will not have open blooms in May. You’ll have to trust the tag for the information as to the type and color of the flower. The trouble with trying to buy a blue hydrangea is that even if it is blue in it’s container it may change color in the ground. All blue flowering hydrangeas are of the macrophylla variety, sometimes called the mopheads. You’ve no doubt heard of the Nikko Blue and Endless Summer which can have blue flowers. They are sold as blue-flowering, but if your soil is not acidic enough, the flowers will be more pink. Potted plants are grown in special soil which is more controlled as to it’s alkaline and acidity levels. Yard dirt can vary widely in acidity. In New England the soil tends to be acidic, so my blue hydrangeas truly bloomed blue. The flower color change can only happen with the macrophylla variety hydrangeas. The paniculatas – like my Pinky Winky – do not change color no matter what type of soil they grow in. To guarantee a blue flowering shrub, first test your soil. Buy a do-it-yourself test kit to find out if your soil has the right acidity to create blue blooms. A pH below 6 means you should have blue flowers. If it’s above 6, plan on pink ones. If your soil is too alkaline to grow blue flowering hydrangeas, consider growing them in a big pot where you can control the soil’s pH and get the color you want. This is tougher to do in the ground. To get blue flowering hydrangeas a soil acidifier must be added to the ground. Something organic (I am an organic gardener) can be purchased. Carefully follow the directions, and add as often as the package recommends. Additions to the ground will not last. Rain will wash away the changes, so it must be done consistently. Other natural ways to create acidic soil may not be enough to create blue flowers all the time, but you can try watering the plant with something acidic mixed with water. I used to pour pickle juice on my gardenia plants. Vinegar in water is another choice. I’ve never done this to my hydrangeas, so you may want to look into it more. Lime lowers Ph (you want a lower Ph for blue flowers) and Sulfer raises Ph.